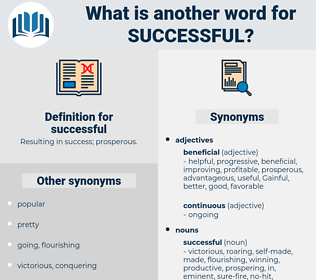 What is another word for successful? felicitous, best, meaningful, favourable, conclusive, beneficial, smooth, viable, flourishing, well-functioning, victorious, helpful, well-performing, fortunate, satisfying, able, popular, accomplished, results, brilliant, outcome, outcomes, affluent, fine, worthwhile, nice, wonderful, beautiful, affirmative, unsatisfactory, welcome, suitable, fruit, lucky, ineffective, inconclusive, gratifying, joyful, workable, fertile, acceptable, high-performing, valid, chosen, bright, favorable, candidate, best-selling, talented, progress. 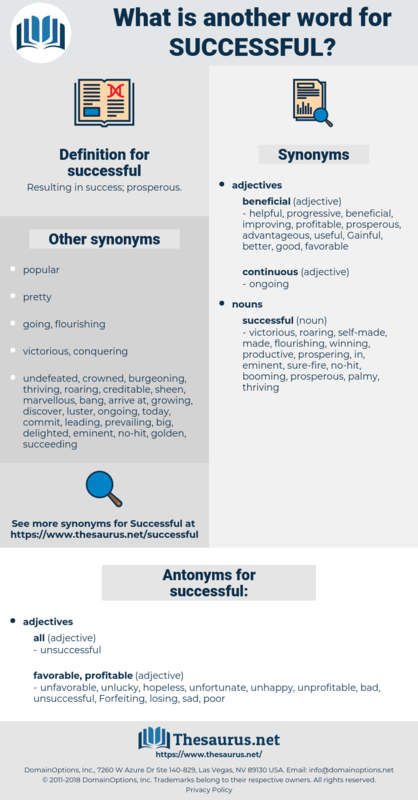 fruitful, prosperous, useful, success, productive, profitable, efficacious, excellent, thriving, constructive, happy, cost-effective, rewarding, valuable, successfully, qualified, effective. sad, bad, losing, unlucky, unfavorable, unprofitable, unfortunate, hopeless, Forfeiting, poor, unhappy. goalless, ruined, no-good, broken, Woful, wrecked, insolvent, failing, crushed, dying, bankrupt, struggling, kaput, empty-handed, slipping, miserable, thwarted, wretched, out, unpromising, declining, failed, waning, ill-starred, Languishing, futureless, fallen, Bankrupted, destroyed, folding, inauspicious. The second attempt was little more successful than the first. A successful adventure was made, the next day, with one passenger.